I finished playing The Legend of Zelda: Ocarina of Time 3D Master Quest a couple weeks ago and I thought that I could share with you my thoughts on the difficulty. As I’m sure you know, there are several factors to the Master Quest that increase the difficulty level. The main thing being that the dungeons have more monsters and different puzzles. I owned the Gamecube version of Ocarina of Time Master Quest, so I was pretty familiar with these. The other things to add to the difficulty are the double damage taken by Link and the entire world is mirrored. I have played both versions of Twilight Princess, so I had previous experienced with a mirrored Zelda game before and thought this element would be the least of my worries. 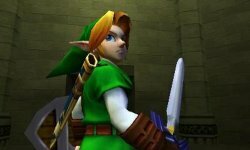 The one thing about Ocarina of Time is that I have played it so much more than any of the other Zelda games that the mirror actually kept getting to me. You constantly have to think about where things are and tell yourself “left is right, right is left.” This will be little problem for newcomers to Ocarina of Time. While they will have played through the original quest at least once, their unfamiliarity with the layout will actually be an advantage in the Master Quest. The double damage in Master Quest is very evident right from the start of the game! I typically don’t bother using my shield much in Ocarina of Time and just take hits knowing that there are plenty of recovery hearts around every corner. In Master Quest, this is not the tactic to take! You really have to play with a defensive mindset! Taking chances with hits is a bad idea especially early in the game. Even simple monsters like keese fill you with dread. My strategy in combating the double damage was to acquire every heart piece I could as early as possible. This helped me stay alive for most of the game. Obtaining all four bottles and keeping fairies, milk or potion in them is also a great suggestion for staying alive. In addition to the mirror of the whole game, the different dungeon puzzles in the Master Quest make you think in a whole new way. Most Zelda puzzles have a rhyme or reason to them, but in the Master Quest, logic is thrown out the window. I personally found Dodongo’s Cavern the most challenging, but other dungeons had me stumped at times as well. I don’t want to give any spoilers, so I will leave it at that. One little tidbit I will share though is that cows give milk if you play Epona’s song, even if the cow is high above your head! The Master Quest is a really great addition to Ocarina of Time 3D and gives seasoned players something new to experience! Completionists will find it especially challenging hunting for Gold Skulltulas in each dungeon because even they have been moved around! The Master Quest Boss Battle Mode is really intense and definitely pushes your skills to the limit! As I mentioned in the Master Quest, I worked hard to increase my heart count. In the Boss Battle Mode, it doesn’t matter how many hearts or what items you had prior to facing a specific boss in the main game, you are given a set number of hearts, and no bottles. In some cases, one hit can from the boss can bring you down to near death. I accidentally was picked up by one of Morpha’s tentacles and as it squeezed the life out of me shaking me back and forth, it drained every drop of my health from full, all the way down to one quarter heart! So, did you play the Master Quest? Did you find it especially challenging, or was it a piece of cake? What did you think of the Master Quest Boss Battle Mode? I’d love to know your thoughts in the comments!